Last night’s supper was quick and easy. The rice took the longest to cook at 20 minutes. 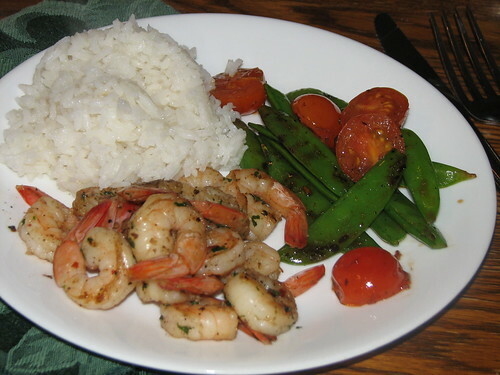 Check this link for the recipe for Pan Seared Shrimp I started with, from Gina’s site. She has a lot of recipes worth perusing. I stir-fried our shrimp and used the following ingredients. Gina’s recipe called for more shrimp and a 1/4 tsp. crushed red pepper. That was too much red pepper for my family, so I cut it way back. If you like heat and are used to using lots of red pepper, you’ll probably want to follow Gina’s recipe more closely than I did. Stir frying is quick and easy. I started the rice, waited about ten minutes, then cooked the pea pods first as they take a bit more time than the shrimp. I used the same wok, without cleaning, for the shrimp after the veggies were done. Heat the oil in a wok (or large skillet), add the shrimp and stir and toss until they begin to look done. Just takes a few minutes. Add the rest of the ingredients and cook for a minute longer. That’s all it takes. The shrimp had the tiniest bite of heat. DD and I loved them. DH gave them a “passing grade” which means he is happy to see them on the menu again. The pea pods are easy to make and delicious. Add a teaspoon of olive oil to the wok. Add the pea pods and stir and toss until they begin to turn bright green with fried bits down the sides. Add salt and pepper to taste. When the pea pods are almost done, add halved cherry tomatoes and cook for one more minute. Serve. Sometimes I add some tamari at the same time I add the tomatoes for a richer flavor. If you don’t have tamari, you can use regular or low-salt soy sauce, though the veggies are delicious with just a touch of salt and pepper. This entry was written by ~~Rhonda, posted on February 10, 2010 at 11:59 am, filed under cooking, Recipes and tagged cooking, Recipes, stir fried shrimp, sugar snap peas with cherry tomatoes. Bookmark the permalink. Follow any comments here with the RSS feed for this post. Post a comment or leave a trackback: Trackback URL.